You have to play Unheard with headphones. A new detective game from Next Studios, Unheard drops you into the aural soundscapes of crimes-in-progress. In each case you're a fly on the wall, and you have to suss out the truth using only what you can hear. So, okay, you could use your computer speakers and get by just fine. But that’s like blasting Dark Side Of The Moon on phone speakers; headphones are the much better option. Unheard makes use of binaural and proximity-based audio to place you in the midst of ongoing scenes. It’s reminiscent of live plays like Sleep No More or found-footage mysteries like Her Story, only your sole input is audio. You can scrub back and forth along the timeline like a YouTube video and move your virtual avatar between different areas, following different characters or just exploring. Each environment adds its own quirks. In some, you might just be seeking an admission of identity or guilt. But in others, you have to identify key items and track them, a difficult prospect in a world with extremely limited vision. Given only a barebones floorplan and the position of each speaker, audio cues are used to great effect to communicate critical non-verbal exchanges. In the second case, you’re tasked with finding a stolen painting and figuring out who nabbed it. Or rather, who stole it first, and who ultimately stole it, because as it turns out, that might be two different people. You can follow around a buyer, the owner, the painter and his assistant, or any number of shady characters, but the key becomes tracking the movement of one—or possibly several—copies of a painting you can’t see. Without handing you the solution, I’ll just say that I had to double-check my assumptions a few times as I repeatedly scrubbed through the logs. The excellent use of audio is what elevates Unheard’s mysteries. Hearing speakers move around you, whispered conversations in the corners of rooms, and muffled noises or ringtones through walls helps you start to establish the timeline of events. A comment tool lets you add short quips that will fly across the map at points you designate, which was immensely helpful in tracking when someone picked up the phone or sent a text. When I was trying to suss out who was calling who, the comments let me tail suspects and time the moment someone picks up a call with the moment another dials them. Due to its sensory-dependent nature, it’s helpful that Unheard’s voice actors provide just the right amount of personality and inflection. The delivery can seem cheesy to start, but over time the emphatic performances really helped me pick voices out of a crowd. In the art gallery, as a commotion stirred in the crowd when the star painting was stolen, art collector Greene’s distinct accent and delivery was discernible enough for me to pinpoint as he was having a clandestine conversation in the back corner of the room. As the story progresses, the voices begin to play an even greater role. 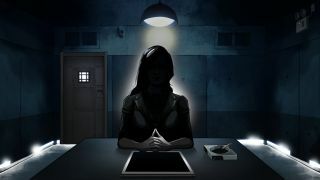 The framing between each individual case poses the player as a detective, participating in a groundbreaking new auditory investigation unit meant to solve cold cases. But as you unveil the hidden identities of the Keyser Söze-esque kingpins and culprits behind accidental tragedies, your situation grows more sinister. Where are you? Are you here of your own volition? Is this really what my handler is telling me it is? Taking away a critical sense works in Unheard’s favor, adding an extra layer of intrigue to each of its cold-case crimes. Every discussion is met with that much more skepticism, and as I listen in on one exchange in one room, I’m already peering at the names moving around like ants inside the glass. I’m marking off suspects and taking notes, all the while picking who to spy on next, knowing every question can be answered if I just listen closely.